Adalight is a do-it-yourself LED project kit that adds realtime ambient lighting effects to your computer monitor or home theater media PC. Inspired by the Ambilight feature of Philips’ LCD HDTVs, Adalight adds pop to TV shows, movies or games! Adalight relies on the fact that many people now have a computer in their living room for streaming video. Our special software continually analyzes the content of the screen to generate an immersive lighting display. It is not a “pass through” device and does not work with your cable TV box or game console, only computer-driven content. The system is built upon some of the most popular cross-platform, open-source tools, so it works equally well on Windows, Mac or Linux computers. Technical users can climb in and make their own changes — larger displays, multiple monitor support, or adding new features. Every monitor is a little different, so this project requires a bit of “maker ingenuity” to complete. Please read through the complete tutorial ahead of time for ideas on parts and tools you may need. 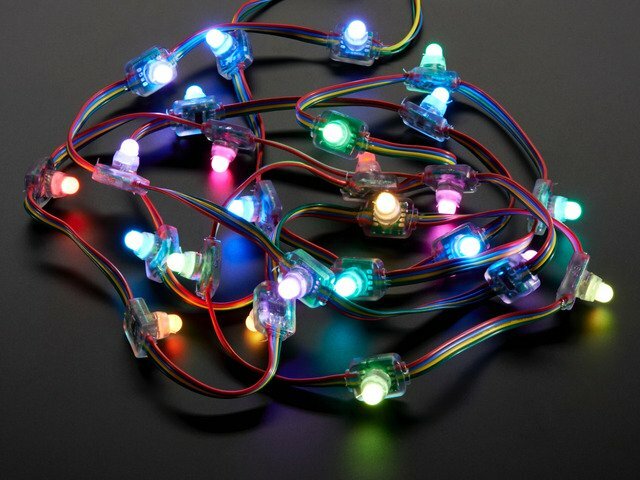 Our Digital RGB LED Pixels are the ultimate Christmas lights. Under software control, the color and brightness of every single “pixel” can be set and animated. The 25 pixel strand included in the Project Pack is is suitable for monitors up to 27 inches (70 cm) diagonal. Arduino is the microcontroller development board that’s taken the DIY world by storm. Adalight uses an Arduino Uno connected to a USB port to shuttle data between the host computer and the lights. Processing is a programming environment designed for multimedia applications and first-time code developers, and it runs equally well on Windows, Mac and Linux computers. If you’ve never programmed before, that’s okay — we provide all the code, you just need to install it and start it running. The Adalight Project Pack bundles together one strand of our “bullet” LED Pixels (25 lights), a 5 Volt power supply and a DC jack adapter (so there’s no soldering required). You provide your own Arduino microcontroller — we highly recommend using the Arduino Uno. The project pack a good starter setup, or you can choose to buy all the parts separately if you have plans for a larger or more specialized display. As explained in the introduction, please read through the complete tutorial for an idea of what other parts and tools you may need: USB cable, wire, tape, etc. 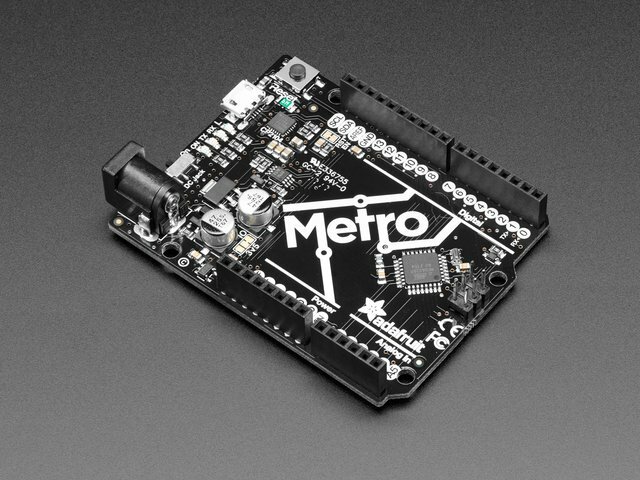 Why doesn't the Project Pack include the Arduino microcontroller? Arduino has become so popular among electronics hobbyists that many already own one…or even have spares around. This also allows a choice for technical users who may want to substitute a different microcontroller and not have to pay for an Arduino they won’t be using. Wouldn’t the Arduino Mega be faster and better? Not in this case. The Arduino Mega has more I/O and RAM — it’s great for robots and such — but these provide no benefit for Adalight. So if you’re buying a microcontroller specifically for this project, save some money and get the Uno. Adalight also works 100% with older Arduinos like the Duemilanove and Diecimila (even the earlier “168” version), if you have a retired one sitting around. Do not use an Arduino Leonardo…this is a young product and still has some quirks preventing its reliable use with Adalight. You can press wires directly into the plug connector. This works best with breadboarding jumper wires or solid-core (not stranded) copper wire. Only three wires will be used. The red wire does not connect to the Arduino. Alternately, if you don’t want to use the “jammed wires” trick, an optional mating connector is available in the Adafruit shop. This has a plug housing at one end and four tinned wires at the opposite end…strip a little more insulation to press these into Arduino pin sockets. The red wire does not connect to the Arduino. You can trim this wire from the mating connector or insulate it with tape or heat-shrink tube. Three wires connect the Arduino UNO to the input end of the LED strand: the BLUE wire can connect to any Arduino GND pin. GREEN should connect to PIN 13 (SPI clock), and YELLOW to PIN 11 (SPI MOSI). The RED wire is NOT CONNECTED. Even though we don't suggest it, you can use an Arduino Mega, connect Green to 52 (SPI Clock) and Yellow to 51 (SPI MOSI), red and blue are the same as above. With the Leonardo, unfortunately the SPI pins are on the 6 pin programming header in the center of the board, so its really not suggested. The extra red and blue wires are for connecting power, but we’ll do this at the other end of the strand. The exposed wire ends at the INPUT end will be carrying live current, so these should either be trimmed flush with the insulation, or better yet, covered with tape or heat-shrink tube. 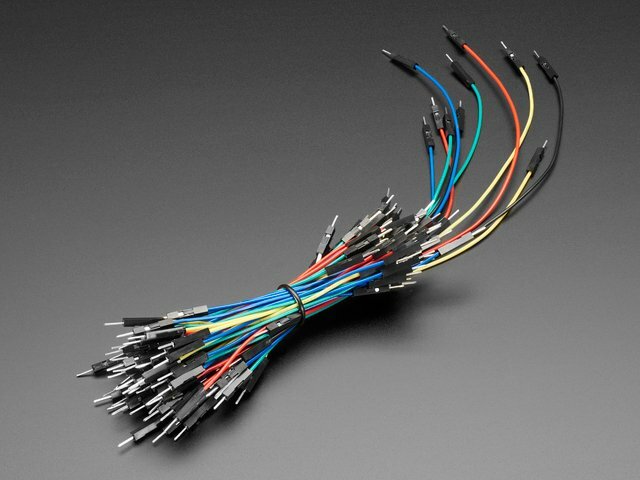 Don’t trim or insulate the wires at the opposite end…we need those! Power will be connected to the same red and blue wires at the output end of the strand. Data can only go one direction, but power can flow either way! 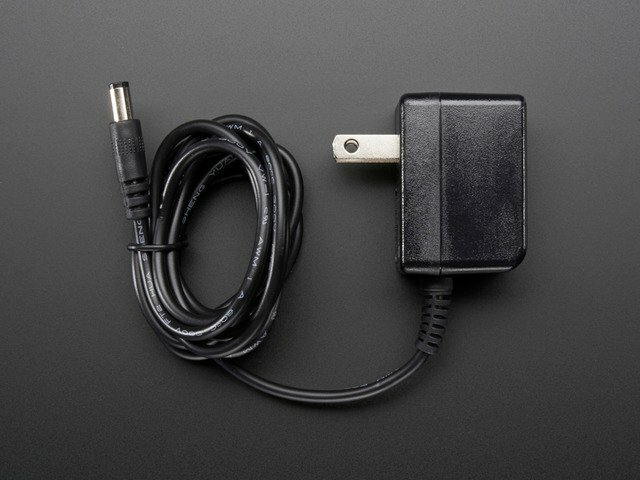 The DC power jack has embossed “+” and “–” symbols on the top face. Connect the RED wire to + and the BLUE wire to –. Insert the wires into the “jaws” of the jack and cinch down the screws to hold the wires securely. We’ll install the software next, because it’s easier to test and troubleshoot the electronics on your desk than behind the telly! First, download the Arduino IDE (integrated development environment) from the Arduino web site. Select the version of the software for your computer type: Windows, Mac or Linux. Read the Getting Started page for an explanation of how to install the software on your computer. It’s a little different for each of the three operating systems. Next, download the Processing IDE from the Processing web site. The first section of the Getting Started page explains how to install the software. The Arduino and Processing IDEs look VERY similar! If you encounter problems with the Adalight code, you may have loaded it into the wrong IDE. After uncompressing the ZIP file, you’ll need to move some files into place. If you’ve run the Arduino and/or Processing IDEs before, there will be corresponding “Arduino” and “Processing” folders inside your personal “Documents” folder (or “My Documents” in Windows). In that case, move the contents of the Arduino and Processing folders from the Adalight ZIP file into the corresponding document folders. If the Arduino and Processing folders don’t yet exist on your system, you can just copy these from the Adalight ZIP file to your Documents folder. The other files and folders in the ZIP file can be ignored. These are for advanced users and aren’t essential to its use. DO NOT use the “LEDstream_LPD8806” sketch/folder unless you are specifically using LPD8806 LED strips in a custom build. Use just the plain “LEDstream” folder when building the Adalight Project Pack, or for a DIY setup using similar WS2801 LEDs. Exit the Arduino and Processing IDEs if they’re running. The newly-installed folders aren’t visible until the next time these programs start. The Arduino IDE must be installed before this step. Connect the Arduino board to your computer with a USB A-to-B cable. When connected for the first time, Windows users will prompted to install a driver. This is explained in the Arduino Getting Started guide for Windows. No driver is required for Mac or Linux. Launch the Arduino IDE. After a moment, you should see a simple blue and white window with some buttons. From the File menu, select Sketchbook, which should “roll over” to show LEDstream. Select this. From the Tools menu, select Board, then Arduino Uno (or whatever Arduino board type you’re using). From the Tools menu again, select Serial Port, and then the port corresponding to your Arduino board. Because the Arduino stores the program in non-volatile memory, you should only need to do this upload process once, not every time you want to use Adalight. If the LEDs do not flash, make sure all the wiring matches the previous page, and that the power supply is plugged in. Proceed with this step only after the Arduino is programmed, the wiring is completed and the LEDs display the red-green-blue startup sequence. Launch the Processing IDE. After a moment, you should see a simple gray and white window that looks very similar to the Arduino IDE. From the File menu, select Sketchbook, which should “roll over” to show Adalight and Colorswirl. Select the latter first: Colorswirl. If the Arduino is the first or only serial device on the system, this should start a colorful rainbow of animation on the LEDs. This will be different on every system, so we can’t just tell you what to put there. Another way to locate the port name: in the Arduino IDE, this is the port you selected in the Tools→Serial Port menu before programming the chip. Once you have Colorswirl working, make note of the change (if any), because the same change will need to be made in the Adalight code. From the File menu, select Sketchbook, then Adalight. If you changed the Colorswirl sketch to find the serial port, make that same change to the Adalight code. Now click the Run button. Though they’re in a jumbled mess on your desk right now, the LEDs should light up in colors resembling the perimeter of your screen. Move some windows around the edge — you should see the LEDs react to this. As it runs, the software performs a continual series of screen captures, averaging the pixels in blocks around the perimeter of the screen and issuing the resulting color data to the LEDs. You can hide the preview window and let the sketch continue working in the background. Being capture-based, it’s not tied to any one specific media player, and most anything you can put on your display — MPEG movies, YouTube, games and so forth — can benefit from the effect. It seems to work especially well with the outer space sequences in Cosmos…a bit ironic in that Carl Sagan’s “Spaceship of the Imagination” from this series featured a giant flat screen and mood lighting decades before Philips turned it into a commercial product! If you plan to arrange the LEDs similarly to our examples — 25 pixels in a ring, 1 pixel gap at the bottom, with the first pixel starting just left of the gap — then nothing more needs to be changed in the software. If using a different layout, you’ll need to make adjustments in the code. You'll find extensive notes in the source code for making this (and other) changes. Before mounting the LEDs behind the monitor, run the software with the LEDs loose on your desk to confirm that everything works. This will save time and heartache in the rare event that a strand has a defect and needs replacing. Our goal is to install the LEDs behind the screen, projecting light back and outward around the perimeter, illuminating the wall behind. Every TV and monitor is different, and exactly how and where to best mount the LEDs is more craft than engineering. This is where the “maker ingenuity” comes into play! While some of our customers have fabricated amazing metal frames and laser-cut acrylic mounting plates, the tools and materials really don’t need to be that advanced. To prove this, our sample setup uses nothing more than cardboard and tape! You can keep it simple or take it as far as your personal skill set allows. It’s not rocket science! Next, calculate the spacing for a ring of 25 LEDs. For this monitor, it worked out nicely as a 9x6 rectangle, roughly 2" spacing, with a one pixel gap at the bottom where the monitor stand protrudes. Perfect! Notice how the LEDs are spaced along a grid: there’s an equal number along the right and left sides, and (except for the gap for the monitor stand) equal spacing along the top and bottom. As mentioned in a prior page, the software may need to be adjusted for the number of LEDs across and down, if your template is different than this. When designing your LED holder, make sure it doesn’t block any air vents on the monitor or computer. The first LED was attached at the center bottom, just to the left of the monitor stand, and then the rest were positioned in order around the perimeter, ending just to the right of the stand. Once the LEDs are situated, the Arduino can be placed (double-stick foam tape works nicely) and wired in. Connect a USB cable between the Arduino and computer, and a compatible 5 Volt supply to the LED power connector. The mass of wires and tape may look chaotic from this side, but once the monitor is set up close to a wall, nobody will see it. Cable ties work well with pixels on their side. Holes can be made using an awl, or you can make very clean holes using a leatherworking punch. LED pixels can be press-fit into holes drilled through metal, wood or plastic. Holes 11 to 12 millimeters in diameter seem about right — experiment on a piece of scrap material first, find a size that gives a firm but not damaging grip. Forum user “Wackid” made this stunning 100 LED Adalight frame using aluminum U-track with drilled holes carefully spaced around the perimeter. Extreeeeme! Adalight depends on several parts all communicating successfully: computer, Arduino and LEDs. We recommend following the tutorial in-order; don’t proceed to the next step until the prior step is tested and known working. This is much easier than tracking down one small problem in the whole complex system. I’ve followed the wiring diagram and successfully uploaded code to the Arduino, but nothing happens. No R-G-B flash. Double-check all wiring. Are the green and yellow wires swapped? Is ground connected to the Arduino? Confirm that the Arduino is connected to the input end of the strand. Check power supply polarity and voltage. Are + and – swapped? If you have a multimeter, confirm 5V DC output (±10%) from the power supply. Are the power wires at the opposite end of the strand insulated or trimmed? They should not be left exposed where they might make contact with metal, or each other. Is the correct board type selected in the Arduino Tools→Board menu? After checking everything, press the reset button on the Arduino. If the wiring and power are correct, you should see the red-green-blue flash sequence. A few LEDs randomly turn on when power is applied, but then nothing happens. Confirm the Arduino is connected to the input end of the strand. Did the LEDstream code successfully compile and upload? Only the first few LEDs respond. The rest remain off or flicker randomly. Inside each pixel there’s a small circuit board. Give the first bad pixel (and the one immediately before it) a firm squeeze where the ribbon cable joins the board — it may simply be a dodgy connection. If that works, you can either cut out the offending pixel and join the two sub-strands, or arrange for a replacement strand if new. The LEDs flash through the R-G-B sequence, but nothing works after that. No Colorswirl, no Adalight. Most likely the wrong serial port is being opened. Read through the “Running the Software” page again, and track down the correct serial port for the attached Arduino. Colorswirl works, but no love for Adalight. Not all software works with Adalight. Anything using hardware-assisted decoding or rendering — some DVD player software and 3D games — bypasses the normal frame buffer and are not accessible to code running on the computer. Some programs will have a “software renderer” option that may help. Or try running in windowed mode (rather than full-screen). Sounds like you may have uploaded the LEDstream_LPD8806 sketch to the Arduino board instead of the regular LEDstream. 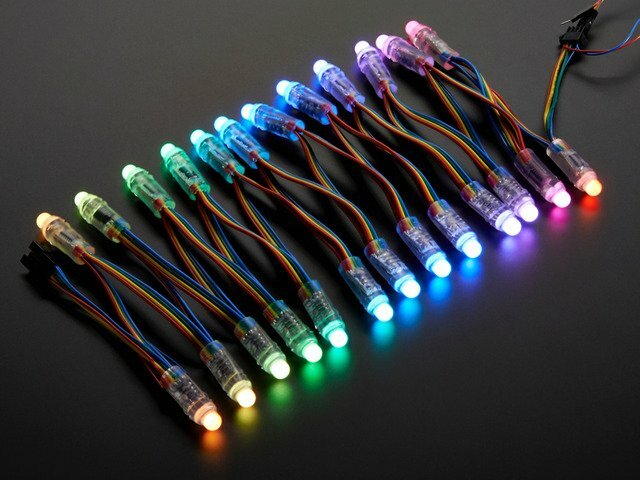 For the Adalight Project Pack, or custom builds using similar WS2801 LEDs, you want the latter sketch, LEDstream. The LEDstream_LPD8806 sketch is only for custom builds using a different type of LED strip. I’m a Linux user and have a 32u4-based Arduino-compatible board (Leonardo, Teensy, etc.). The Arduino code uploads OK but the Processing code can’t access the serial device. Computers will make our lives easier! 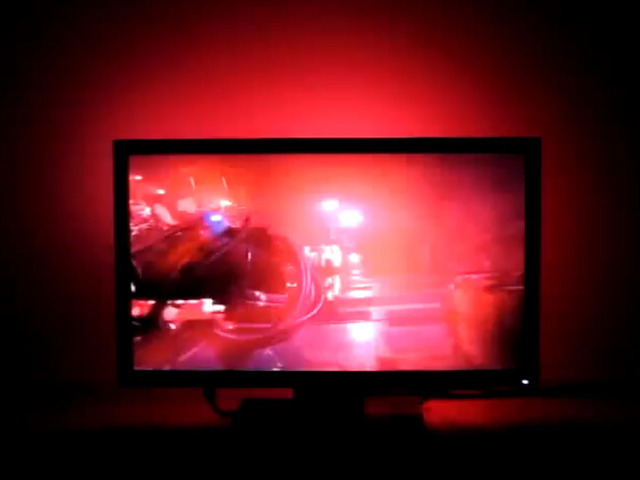 This tutorial focused on the 25 LED Adalight project pack, which is good for monitors up to 27 inches diagonal. Some users want to build a larger rig for their living room TV. This can be done without too much trouble…but, just like the LED mount required some creative problem solving, boosting Adalight with additional LEDs will require some planning and a willingness to improvise in order to fit your specific situation. Wiring for 50 LEDs is super easy: follow the wiring diagram that was given for the standard project pack (substituting the larger power supply above). Just as before, the DC jack adapter connects to the extra red and blue wires at the end of the first strand of LEDs. Then plug the second strand of LEDs into the end receptacle, and make sure all spare red/blue end wires are insulated or trimmed. Done! The second strand receives power through the mating connector. Wiring for 75, 100 or more LEDs is a little more complicated. You’ll need some additional wire for distributing power, and a bit of soldering may be required. The trick here is to minimize the length that power needs to travel along the LED strands. This ensures better brightness and more uniform color. As explained in the project pack tutorial, 5V can be applied at either end of a strand. We exploit this in the 50 LED setup above by connecting power near the middle…25 LEDs are powered in one direction, and 25 the other. With more than 50 LEDs you’ll need to provide additional connections for power. This could be done at the start of every strand…but using the same trick as above, it’s also possible to alternate strands: for 100 pixels, connect power to the wires at the end of the first and third strands, and the others will receive power through the mating connectors. Distribute power using extra wires connected at the DC jack. You can screw down two or sometimes three wires in each terminal. If that’s too crowded or if you want more secure connections, solder your own “Y” connections and insulate these with heat-shrink tube. 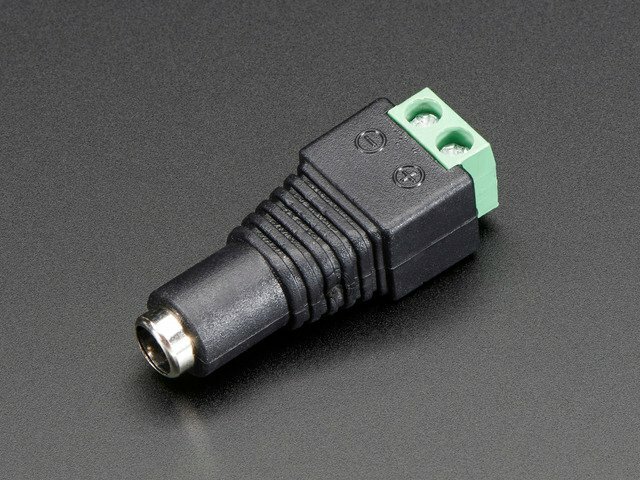 To connect to the strand power wires, you can either solder and insulate these connections, or use Euro-style terminal blocks — these can be clipped apart to provide two + and two – junctions. No changes are required in the Arduino software; it’s designed to work with arbitrarily large LED setups. If you’ve already uploaded the code to the Arduino board, you do not need to repeat this process. The Adalight Processing sketch will require modification. This is the tricky part that’s specific to your setup…it’s not a simple copy-and-paste change, because televisions have different bezel sizes, stands, speakers or other obstructions to take into account. Arts and crafts time! We need to sketch out a grid that’s close to the shape of the screen, with the right number of squares around the perimeter to match our LED strands. It’s recommended that you try a few sizes and iterations on paper. You don’t have to put LEDs in the corner squares (some users don’t like the look and will skip them), and in the end you might end up with a few more LEDs than grid squares — that’s okay, you can bundle the extra unused LEDs behind the screen. Number the columns starting from 0 at the left, and the rows starting from 0 at the top. We’ll need these coordinates later for telling the software the position of each LED pixel. One common arrangement with 50-pixel installations has 17 squares across and 10 squares down, because it’s close to the 16:9 aspect ratio of most HDTVs. Grid location (0,0) will then refer to the top left square, and (16,9) to the bottom right. I like to put the first LED (the one closest to the Arduino) at the bottom center of the screen, because the USB and power cords can be bundled alongside other cables already coming from the display. But you can start at any position, whatever works best with your own telly. The two numbers highlighted above should be changed to the width and height of your grid (17 and 10 for our sample grid above). Leave the initial '0' untouched. And you can ignore the second line (in gray) — that’s for multiple monitor setups. If you try to run the modified program but it throws an error, you’ve probably mis-typed one of these number sets. Make sure there are three numbers in each set, separated with commas both between numbers and between sets. Once the Processing sketch is working to your satisfaction, you can build a double-clickable standalone version that doesn’t require running the Processing IDE every time. Load the Adalight.pde sketch in Processing. Then, from the “File” menu, select “Export Application.” Select your OS type, do not check the full-screen option, then click the “Export” button. This will create an application folder containing the standalone program and some support files. You can quit Processing now and just use the standalone version. We’ve experimented with a stealth windowless version of Adalight…can’t say for certain how reliable this technique will be across all different systems, but you can try out the technique described in this this forum discussion and see what you get. If editing Processing code isn’t your style, there are third-party software options that can also drive Adalight. Because we didn’t write these packages and aren’t familiar with their inner workings, we can’t provide technical support. If you’re having trouble getting an Adalight system up and running, we’ll always ask that you start with the Processing sketch first. Once that’s working, then feel free to explore. We’ve found Lightpack to be easy to use with a nice GUI and good performance. Don’t download the firmware file, just the software — with Adalight mode selected, this works with our LEDstream sketch already on the Arduino. The Russian site for Lightpack is a little more bleeding-edge, and includes Mac and Linux versions. Boblight is another popular choice among Linux users. This is perhaps the most complex to set up, even moreso than the Processing code. With the right plug-in it’s said to also work with xbmc, but we’ve never gotten this far with it. This guide was first published on Jul 29, 2012. It was last updated on Jul 29, 2012.